With the junior hockey season officially coming to an end that means its also the official end of our In the Pipeline feature. It will return again in the fall presumably in October when the hockey season kicks off. I want to wish everyone a great summer and also a congratulations to the newest graduates of Quinnipiac University, the class of 2018. Best of luck in all your future en-devours. Here is the final In the Pipeline of the season so enjoy. 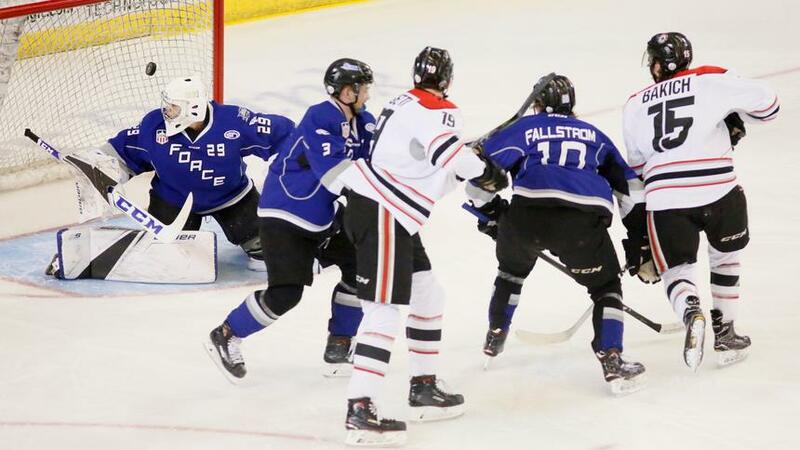 William Fallstrom capped his junior career with a Clark Cup championship for the Fargo Force. In four championship series games he logged one assist. He finished the season with 54 points (16 goals, 38 assists) in 72 games which includes the Clark Cup playoffs. Congrats William on the Clark Cup win and hope you get more hardware during your time in Hamden. 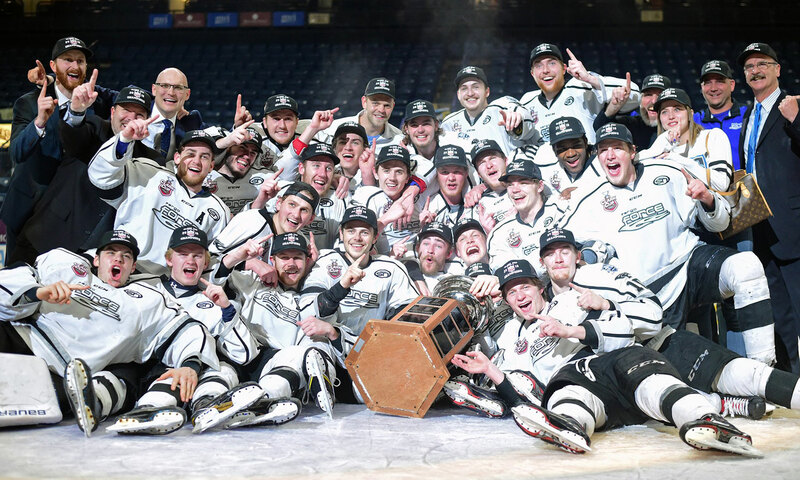 The season has come to a close for Nick Kent and his Wenatchee Wild as they fell in the 2018 RBC Cup semifinals to the Wellington Dukes. Kent was held scoreless in three games played. He finished the season with 2 assists in 47 games for the BCHL champions. He is expected to return to Wenatchee next season. Two Quinnipiac commits were selected to the USA Hockey National Camp. 2001 forward Connor Tait was selected out of the Southeast District and 2003 forward Jack Silich was selected out of the Central District. Congrats to the both of them. The Trail to Quinnipiac pipeline has once again been extended. Quinnipiac has found past success in recent years out of Trail, British Columbia, Canada with Travis St. Denis and current Bobcats Craig Martin and Scott Davidson. Starting in the 2019-2020 season, Quinnipiac will have another Trail product in 1999 born forward Tyler Ghirardosi who committed to Quinnipiac on May 13th. 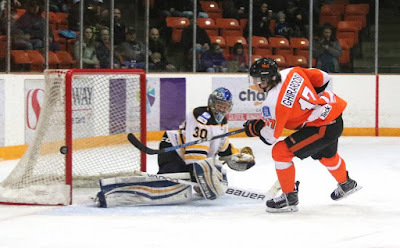 Coming off a successful rookie season with the Trail Smoke Eaters (BCHL), Ghirardosi will give Quinnipiac some size and scoring up front. 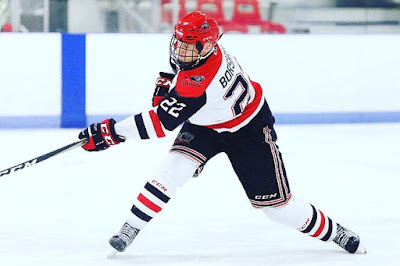 Tyler was gracious enough to give the BobcatsHockeyBlog some time for a Q&A this week and we thank him to the time and once again welcome him to Bobcat Nation. BobcatsHockeyBlog: First off congratulations. What are your emotions like after making this decision to commit to Quinnipiac? Tyler Ghirardosi: Thank you! It is a lot of excitement. During my visit I loved what I’d seen with the campus and facilities so I had a good gut feeling. BobcatsHockeyBlog: Tell us about your overall recruiting experience? Did you recently visit the Quinnipiac campus? Tyler Ghirardosi: It’s a pretty cool experience, you get treated very well by anyone you meet, they did a great job of making me feel welcome. I visited the campus the last weekend the students were still there. Its a beautiful campus and the rink is unreal. It was an overall awesome experience for me. BobcatsHockeyBlog: When did the Quinnipiac staff first reach out to you to show their interest in you as a player? Tyler Ghirardosi: I believe it started back in mid January. BobcatsHockeyBlog: Did any other NCAA schools show interest in you and did you have offers from any others? Tyler Ghirardosi: Yes. I had interest from a couple other programs but I narrowed it down and decided Quinnipiac would be the best fit for me as a player and as a student. BobcatsHockeyBlog: A lot of players I have seen recently prior to playing in the BCHL usually play major midgets or in the CSSHL. You took a different route playing Junior B hockey. What led you down that path as opposed to those two other options? Tyler Ghirardosi: Good question. The main thing I guess to me is that it was better hockey and I think a better stepping stone to take me into junior hockey. The KIJHL is a good Junior B league to play in. BobcatsHockeyBlog: You had a very solid rookie season with 40 points in 57 games along with another 8 goals and 2 assists in the playoffs. What helped prepare you for such a solid season as a rookie? Tyler Ghirardosi: I think that I was just given the opportunity by the coach. It definitely helps your confidence when the coach believes in you. Our team this year was offensively gifted which always helps as we had four lines that could score. I have to give credit to my line mates as I played with the same guys for the most of the year and they made it easy to communicate and made it fun. Tyler Ghirardosi: I think I would describe myself as a power forward who likes to play a physical game. I like to be in the corners and use my size. BobcatsHockeyBlog: After seeing highlights of your goal against Penticton would you say that hand eye coordination is a strength of yours? Tyler Ghirardosi: Ha Ha. Yes I guess so. I played a lot of street hockey growing up. BobcatsHockeyBlog: You are not coming to Quinnipiac until the 2019-2020 so between now and then what are some of the areas you want to improve upon as a player? Tyler Ghirardosi: I’d like to improve lower body strength and improve my skating, I’m aware that that’s an area I have to work on. You have to be fast in this and any league you play in. BobcatsHockeyBlog: Many players leave home to play junior hockey but you stayed home in Trail to play for the Smoke Eaters. Is there any added pressure to play in front of family and friends day in and day out? Tyler Ghirardosi: No I don’t think so. They are there to support you, so I find that it makes it easy to play in front of them. BobcatsHockeyBlog: Quinnipiac has a couple of Trail guys in Craig Martin and Scott Davidson. How influential were they in helping you during your visit? Tyler Ghirardosi: They helped a lot. I was basically with them for the whole time. It helped knowing someone as it’s easier to ask questions and stuff like that. They made it an enjoyable visit. Tyler Ghirardosi: Yes I do and would love to be Evgeni Malkin. He is a fun player to watch and his size, hands, and hockey IQ are things I want to match. BobcatsHockeyBlog: To this point in your life who has been your biggest influence or role model to help you get this opportunity to play Division 1 NCAA hockey? Tyler Ghirardosi: I think my twin brother Devin. Growing up everything you can think of was a competition. And of course growing up playing hockey together until this past year, we pushed each other in everything we did so I think that would be what influenced me. BobcatsHockeyBlog: Tell us what type of person the Quinnipiac community will get in Tyler Ghirardosi on and off the ice? Tyler Ghirardosi: You’ll be getting an adult that will come to the rink everyday to work. I'll know my role and I won’t try to be someone I’m not. I’m not a guy that will say very many words but I like to lead by example. That’s the same thing in the classroom. I’m there to do my work, hand in assignments on time and go to class. And for the community, I’m someone you can depend on to get stuff done as I hold my self accountable. I’ll be equally respectful and responsible in all those areas. Tyler Ghirardosi: I’m a big fisherman as my father and I go out a lot during the summer months here in Trail. Quinnipiac will be adding another European player to their roster in the near future with the recent commitment of Belarus native Artyom Borshyov. "Arty" as he likes to be called just captained the Belarus Under-18 team to a quarterfinal finish at the World Championships in Russia before committing to Quinnipiac for the 2019-2020 season. Currently back home in the Belarus training for the upcoming season, Arty was gracious enough to give the BobcatsHockeyBlog some time for a Q&A about hockey, his transition to playing in the United States and his international playing experience. Thanks again to Arty and welcome again to Bobcat Nation. BobcatsHockeyBlog: First off congratulations. What are feelings like after making this decision? Artyom Borshyov: I’m very excited to join this program! It is unbelievable like in a fairy tale. My whole family are very excited. BobcatsHockeyBlog: Tell us when you first started playing hockey and how you got into it? Artyom Borshyov: I started to play hockey when I was 7-years-old. At first I wasn’t doing great at it, but after a couple years, I began to take hockey more seriously and it helped me a lot. BobcatsHockeyBlog: Most people know that Belarus was part of the former USSR which dominated international hockey prior to the breakup in the late 1980's early 1990's. What is hockey like in Belarus today and is the talent level rising in the country? Artyom Borshyov: Yes, the talent level is rising. Hockey is the biggest sport in Belarus. Everyone loves it. As for the national teams for (U-17 and U-18) they have exactly the same program like you guys have with the United States National Developmental Program. BobcatsHockeyBlog: You recently played in the Under-18 World Championships for the second time in two years and captained this years team. What was that experience like? Artyom Borshyov: It was unbelievable experience! Last year was the first year in 10 years that we played in elite division. We were in last place in the group and we played Latvia in the relegation round. It was the first time in 14 years that Belarus stayed in Elite division. That was awesome. This year we did even better! For the first time in 16 years we went to a playoff round (lost in quarterfinals to eventual gold medal winner Finland). It was incredible especially for me because I was the team captain. BobcatsHockeyBlog: Prior the Under-18 World Championships did you have any contact with Quinnipiac or was it after playing the United States where Quinnipiac head coach Rand Pecknold was an assistant did the recruiting of you start? Artyom Borshyov: I didn’t have any contact with coach Pecknold before Under-18 World Championships. It was after the game, when we played the United States, we met each other and talked about Quinnipiac University. BobcatsHockeyBlog: Were other programs showing interest in you and if so which ones? Artyom Borshyov: I think RPI was the first school that called my coach Bill Flanagan of the Northern Cyclones. BobcatsHockeyBlog: Is it safe to assume you committed to Quinnipiac without having visited the campus given the timeline of the world championships being held recently and you currently back in your native Belarus? Artyom Borshyov: That is the case but the first thing I will do after I will be done with my school here in Belarus is to visit the Quinnipiac campus over the summer. BobcatsHockeyBlog: What factors went into committing to Quinnipiac after meeting with coach Pecknold at the Under-18 World Championships? Artyom Borshyov: He said that they liked the way I played at World Championships. He told me a lot about the school and it wasn’t a big problem for me to make a decision without going for a visit. BobcatsHockeyBlog: Tell us about your overall game. What are some of your strengths as a player? Artyom Borshyov: I like to play more of an offensive style for a defenseman. I like to jump in on the rushes, make some good plays and to play more in the offense zone rather than defensive zone. BobcatsHockeyBlog: What are some of the areas of your game you want to improve on before reaching Quinnipiac? Artyom Borshyov: I think I need to work on my skating especially on the transitions, because NCAA Division I hockey is some of the fastest hockey in the world. BobcatsHockeyBlog: Are their plans for you to work with a skating coach this summer to improve that part of your game? Artyom Borshyov: Yes, we have a good skating coach here so I will be practicing with him to improve my skating ability to try to make it a strength going forward. BobcatsHockeyBlog: You were recently drafted by Tri-City in the USHL. Do you have any plans to try to make Tri-City in 2018-2019 or will you be returning to the Northern Cyclones again for next season? Artyom Borshyov: I will be going to the Tri-City main training camp and I will be trying to make the team's roster for the upcoming season. BobcatsHockeyBlog: Being a 2000 birthday you will be eligible for the NHL draft for the first time. Have you had any contact yet with NHL clubs or scouts? Artyom Borshyov: I think a couple of NHL clubs were in touch with my coach from the Northern Cyclones. BobcatsHockeyBlog: What made you decide you wanted to play midget and junior hockey in the United States and was it a tough transition being so far from home? Artyom Borshyov: Obviously hockey is better here and if you want to get better you have to leave and come to the United States. My first year was a tough because my whole life changed especially being in a different city, different country with different cultures and traditions. Artyom Borshyov: Not really, I like a lot of players but I’m not trying to model my game after anyone in particular. BobcatsHockeyBlog: Who has been the most influential person or persons in your life that have helped you get to this point? Artyom Borshyov: My mum and dad. I would like to say thank you to them. Because without them I will not be in the position I am in right now with the opportunity to play NCAA Division I hockey. BobcatsHockeyBlog: Tell us the type of person that the Quinnipiac University community is going to get in you? Artyom Borshyov: I am a hard working person who has worked hard everywhere I played or when I have done something in life. BobcatsHockeyBlog: What are some of things that Artyom Borshyov likes to do off the ice when he is not playing hockey? Artyom Borshyov: I enjoy playing video games and soccer. 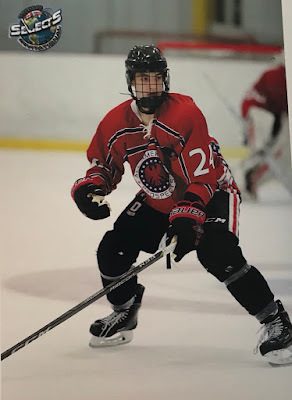 Quinnipiac picked up another recruit, this time on Mother's Day as late 1999 born forward Tyler Ghirardosi verbally committed to the Bobcats for the 2019-2020 season. A native of Trail, British Columbia, Canada, the 6'2, 185 pound Ghirardosi was a rookie this season for the Trail Smoke Eaters in the BCHL. In 57 regular season games, Ghirardosi had 40 points (19 goals, 21 assists) with 56 penalty minutes. 11 of the games were of the multi-point variety. 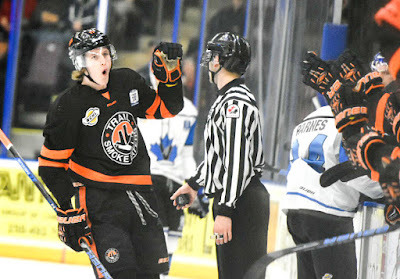 He added another 8 goals and 2 assists in 12 playoff games for the Smoke Eaters including a highlight reel goal against the Penticton Vees in which he flashed strong hands and stick handling ability. Prior to his rookie season with Trail, Ghiradosi spent the last two seasons in Junior B with the Beaver Valley NiteHawks of the KIJHL. In 73 total games over two seasons he had 69 points (32 goals, 37 assists). He had another 12 goals and 13 assists in 30 playoffs games over those two seasons. The Trail, BC pipeline has been very favorable to the Bobcats in recent years netting star forward Travis St. Denis and current Bobcats Craig Martin and Scott Davidson. Congratulations to Tyler and his family on this great achievement and welcome to Bobcat Nation. Four Quinnipiac commits were selected over the two day Phase I and Phase II USHL Draft that took place on Monday night and Tuesday. Two players were taken in the Phase I portion on Monday which features 2002 born prospects. Jacob Quillan was selected in the 8th round with the 117th pick by the Cedar Rapids Rough Riders. A native of Dartmouth, Nova Scotia, Canada, Quillan played this season for the Steele Subaru Major Midgets where he had 67 points (20 goals, 47 assists) in 54 games played. I have heard rumblings he is likely to play prep hockey somewhere in New England next season. He is the younger brother of Colgate defenseman Nick Quillan. One pick later Victor Czerneckianair had his name called by the Tri-City Storm with the 118th pick in the 8th round. I for one expected him to go within the first four to five rounds so Tri-City got nice value with this pick. Czerneckianair spent the past season with the Selects Academy at South Kent U-15 team where he had 76 points (34 goals, 42 assists) in 55 games. As of right now it is expected he will return to South Kent to play for the U-16 team next season. In Phase II portion on Tuesday, Quinnipiac had two players selected in late 1999 born defenseman Cameron Boudreau and the newest commit 2000 born defenseman Artyom Borshyov. Boudreau was selected in the 4th round, 55th overall by the Chicago Steel. He most recently played for the Jr. Bruins (NCDC) where he put up 14 points (3 goals, 11 assists) in 48 games played. He is ranked the 189th for North American skaters on the NHL Central Scouting list. It's unknown if Boudreau will attempt to make Chicago next season at the teams training camp or return to the Jr. Bruins. Borshyov, the newest Quinnipiac commit was selected in the 17th round, 266th overall by Tri-City. A native of Belarus, Borshyov played this past season for the Northern Cyclones (NCDC) where he had 30 points (6 goals, 24 assists) in 53 games played. He captained Belarus at the IIHF U-18 World Championships. Its not known at this time if Borshyov will try to make Tri-City at the teams training camp or return to the Northern Cyclones. While hockey is winding down due to the summer approaching that doesn't mean that the Quinnipiac coaching staff stops recruiting. The Bobcats have picked up a commitment from 2000 born defenseman Artyom Borshyov from Vitebsk, Belarus who played this past season for the Northern Cyclones in the NCDC. A 6'3, 190 pound left shot had 30 points (6 goals, 24 assists) in 50 regular season games played for the Cyclones with 18 penalty minutes. He played another three playoff games in which he did not record a point. A source told me a short scouting report on Borshyov is he has good size, good feet, hockey IQ and is an all around good defenseman. Artyom Borshyov (Northern Cyclones) commits to Quinnipiac. Two-way left-shot D was one of top prospects in NCDC this past year. Played for Belarus at U18 WC. Good get for the Bobcats. 4 prospect is tough to play against at 6'3". Finishes his checks, keeps his gaps tight & has international experience for Belarus. Good speed and skill with a heavy shot. A at NCDC showcase. Most recently he captained the Belarus U-18 team at the 2018 IIHF World Championships in Russia where he had one goal in five games played as the team fell to Finland, the eventual gold medal winners in the quarterfinals. He played against Quinnipiac head coach Rand Pecknold who was an assistant on the United States team and presumably was the one to recruit him. He was selected by Tri-City Storm in the 17th round of the 2018 Phase II USHL Draft. Borshyov is eligible for the first time for the 2018 NHL draft in June. He is expected to enroll for the 2019-2020 season or possibly the 2020-2021 season. Congrats to Artyom and welcome to Bobcat Nation. This is the final two weeks of the junior season with the USHL finals and the RBC Cup commencing this week. Quinnipiac has two commits playing for championships with William Fallstrom in the USHL and Nick Kent for the BCHL champion Wenatchee Wild playing for the RBC Cup which is the Junior A championship in Canada. After this comes four months of no hockey until the fall but there probably will be some commitments to report on plus the schedule release at some point in the summer. 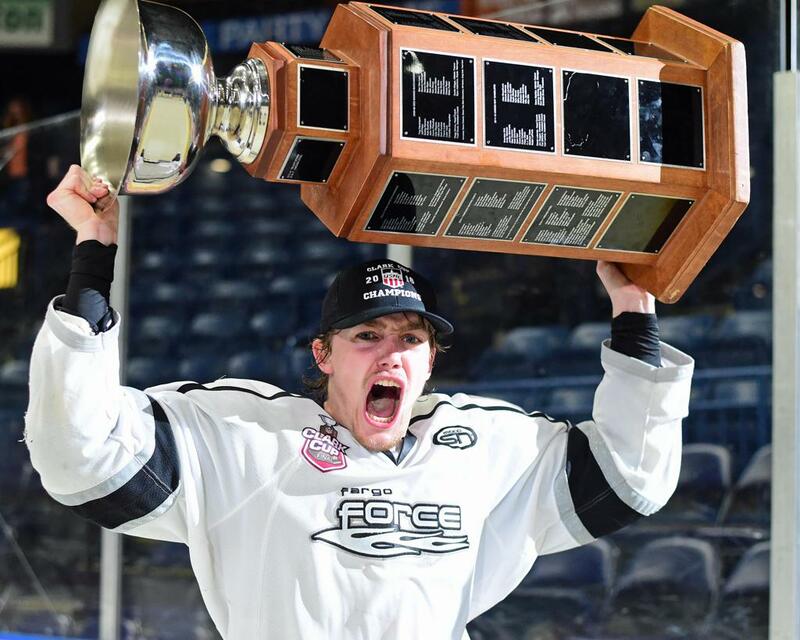 William Fallstrom has had a strong playoffs for the Fargo Force in helping them to the Clark Cup final where they will face the Youngstown Phantoms. In 10 playoff games so Fargo, Fallstrom has 8 points (2 goals, 6 assists) and is a plus five. He is also riding a three game point streak going into the finals. Game 1 of the finals in Friday night in Fargo. Best of luck William as you try to help win Fargo the Clark Cup title. The season ended for Dom Fensore in the USHL eastern conference finals. Team USA lost the series 3 games to 1 against Youngstown. Fensore finished the playoffs with 1 assist in 8 games played and in 61 games this year finished with 31 points (2 goals, 29 assists). Nick Kent and his Wenatchee Wild are moving on to the RBC Cup starting on May 12. Kent got his first two points of the season in the series against Spruce Grove (AJHL) when he had two assists in four games played. Best of luck Nick and to the Wild as they look to bring home the RBC Cup for the first time in team history. 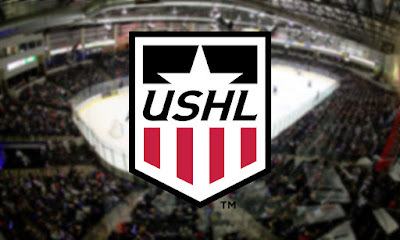 The USHL Phase I and Phase II draft will take place tonight and tomorrow. 2002 commits Victor Czerneckianair, Jacob Quillan and Austin Spiridakis could all hear there names called on the Monday or Tuesday along with other players in Phase II who are not on protected lists. Oscar Plandowski took part in the World Selects Invitational for the All American Prospects team. In 6 games played, the Nova Scotian born defenseman had four assists.